In New England, we have experienced very different conditions in the winter over the past few years. The unprecedented winter of 2014 is still showing its effects. This winter we have experienced an abundance of rain followed by sub-zero temperatures. This has left many homeowners uneasy about their roofs. The weather conditions have wreaked havoc on our homes. Homeowners are now left speculating if and when their roof will fail and what they can do to prevent it. Know the signs of roof troubles and how to avoid a failure in your roof. Removing ice and snow from your roof to relieve the structure will help immensely. Snow and ice can weigh a lot, couple that with the melting process and the weight the roof has to bear becomes much more, which can cause your structure to weaken. According to NBC news, two feet of snow on the average-sized roof can be the equivalent of 38,000 pounds, or 19 tons. Removing the snow and ice will also alleviate some of the mess that happens when the snow starts to melt, including rotting of the roof, your insulation from being damaged or destroyed, gutters from being damaged or destroyed, flooding in your attic, and damaging the interior of your home. There are a few options available to you, the homeowner. You can call a local insured contractor and have them remove the existing snow and ice from your roof. This is the safest way. It can be very dangerous to remove snow from your roof on your own. You may also add just enough extra weight to your roof to make it unsafe and in danger of collapsing. There is an overwhelming amount of people who have had to seek medical treatment after attempting the chore of snow removal on their own. If you do wish to attempt this, you may want to purchase a roof rake. A roof rake can be used safely from the ground. You do not want to try to get all of the snow off as this could damage the material on your roof, causing you to have to get repairs in the Spring. You do, however, want to get the depth of the snow down. 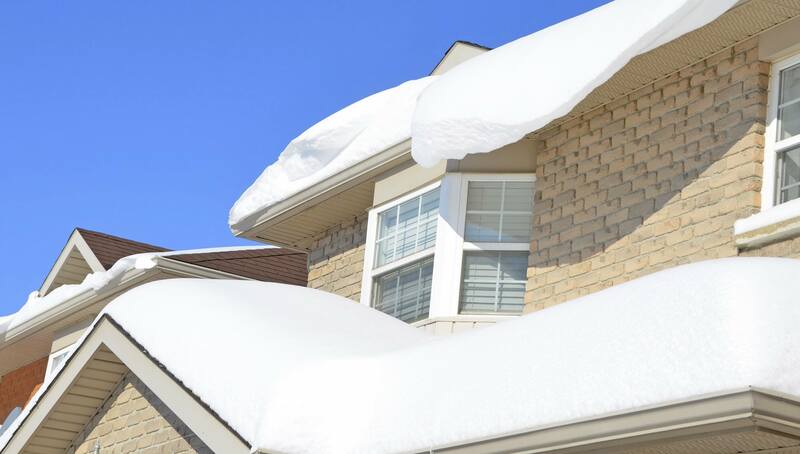 A common mistake is to leave the snow that is higher up on the roof, which in turn, can create ice dams higher up your roofline or it could also continue to feed the ice dam on the lower portion of the roof. There are preventative measures you can take as well. Cleaning your gutters out in the Spring and Fall will help you when the snow starts to fly. Make sure that the gutters are completely free of debris that could get stuck on the way down. When the rain is the main culprit in your roof troubles and leaks have started, you will want to contact a roofing contractor to investigate the leak. A leak may not be coming from the area where you see the leak. Often if water is getting into your home, the leak can be traced as far as 10-20 feet away from where it can be seen. You may have a hole or protrusion in your roof, allowing water to flow. It could also be a flashing issue around a pipe or chimney, or the chimney itself. The best way to know is having a professional take a look.